Disclaimer: The following is written by a 3 year old Undead Mage who's brain has decomposed quite significantly since starting WoW and it is quite possible that all the facts 'n figures of Dotu's history are not present in this article. It was the brainchild of Zombina, an Undead Mage who at the level of 35 decided to create a place for her and her new found friends to call home. Originally Dotu was an Undead only themed guild, this lasted for many months until we all started hitting the level cap of 60 and soon realised that having no Druids, Shaman or to a lesser extent Hunters progress would have been extremely slow if not impossible. And so, we opened our gates later in the year to Trolls, Orcs and Taurens , there was tusk shavings, bulky Kermit the Frog type creatures and cow sh*t everywhere. It was shortly after this time that we merged with another guild, Heroes of Thrall who's leader was an Orc named Higgo (you may have heard of him). In 2006 we started raiding. Most guilds have a label, there either a 'Casual' or 'Raiding' guild. We tryed to do both but it had its problems and a possible solution was thought of, a sister guild was born. Dawn Raiders was created in June and involved around 50 members who's key interest was raiding, moving over to this new guild. With both guilds working together, we cleared most of The Molten Core by July. However keeping both guilds together was proving very difficult as there is no in-game support for 'alliances', and we started to drift apart. Although there was no serious conflict, officers decided to re-merge the two guilds before the gap became too much. We also had our second merge (yes, ok, we like merging, guess its our 'thing'), with STORM who we formed quite a good raiding relationship with. As our previous site (well, 'we have a history of webbys going 'boom!') went down, i cant remember when we had this merge, guessing around the summer? 2007 also saw tremendous grief. The passing of our dear friend and Guild Leader, Zombina. 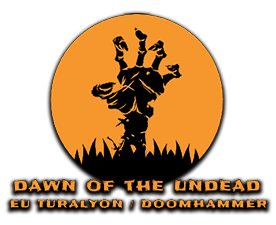 Dawn of the Undead has had its ups and down throughout the years as do does any guild, but it has brought many players together and great friendships have been made. You can never predict the future, but hopefully Dotu will continue to do just that.